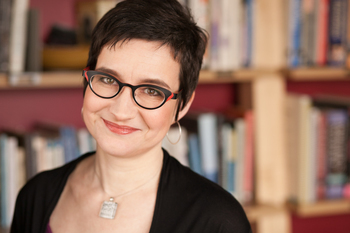 Mare Swallow is an essayist, public speaking coach, and director of the Chicago Writers Conference. She reads her essays and tells stories at events like "Is This a Thing? ", Story Lab, This Much is True, Story Club, and Tuesday Funk. She enjoys high-quality gin and loves living in Chicago. 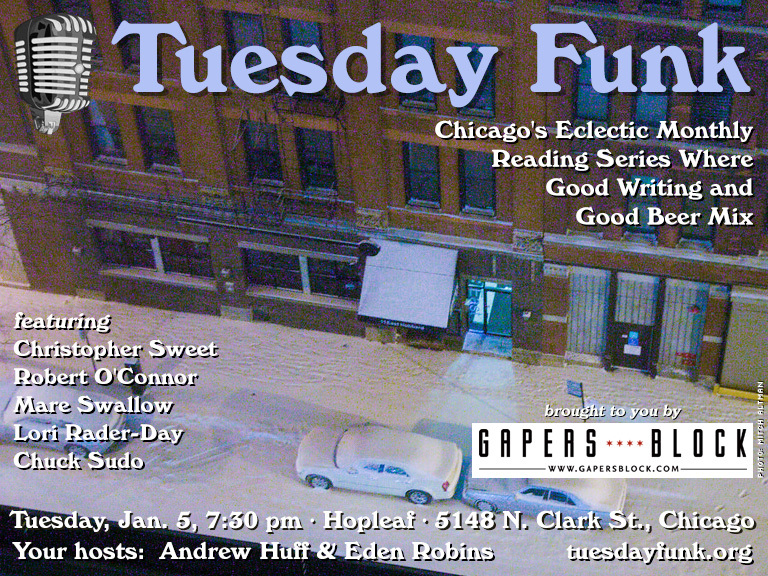 Please join Mare and all our amazing readers on Tuesday, January 5, 2016, upstairs at Hopleaf at 7:30 pm. This 21-and-older event is free. 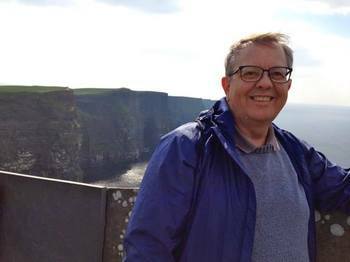 Robert O'Connor is a writer and editor in Chicago, who has edited books for the Chicago Center for Literature and Photography and magazines for the Public Media Institute. 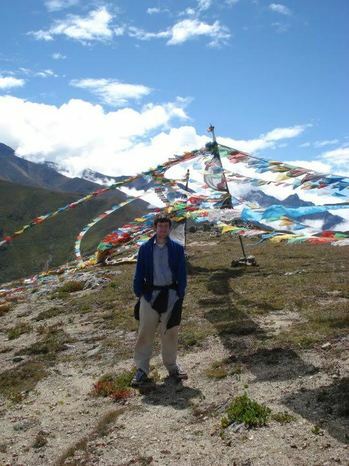 His work has been published in Mash Tun, Proximity, the Lumpen Times, Spike, 3:AM and Gapers Block. His book Hiroshima, Nagasaki, An Illustrated History, Anthology and Guide from Odyssey Publications came out last year and he just finished an intensive design course at the Startup Institute. He's looking for a more stable gig. 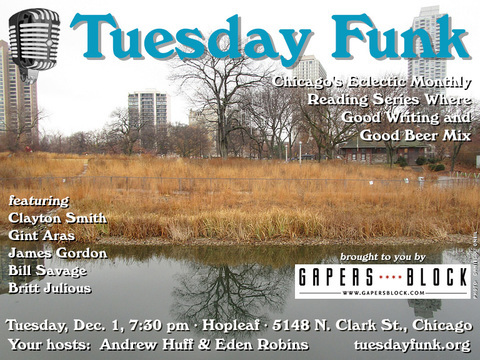 Please join Robert and all our amazing readers on Tuesday, January 5, 2016, upstairs at Hopleaf at 7:30 pm. This 21-and-older event is free. 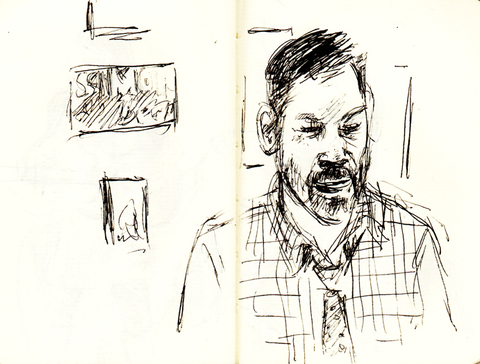 At our December show, artist, writer and past Tuesday Funk guest Dmitry Samarov attended and gave us a gift -- sketches of all the readers -- Clayton Smith, Gint Aras, Britt Julious, Bill Savage and James Gordon. Continue reading Holiday Treat: Sketches by Dmitry Samarov. Christopher Sweet spent virtually his entire working life cunningly disguised as a high school English teacher in the Chicago suburbs. He blogs irregularly at Chicago Now, "Truth and Absurdity Spotting in Chicago," under his boyhood nickname, Kit. 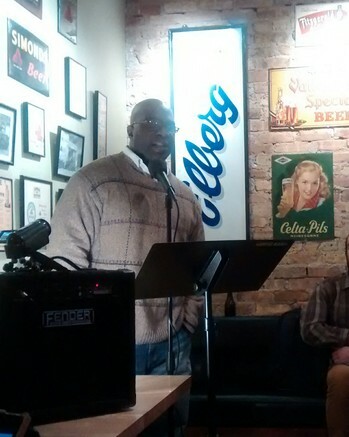 Please join Christopher and all our amazing readers on Tuesday, January 5, 2016, upstairs at Hopleaf at 7:30 pm. This 21-and-older event is free. The Dec. 8 edition of Tuesday Funk saw a collection of topical haiku from co-host Andrew Huff that touched a nerve. It's a new year soon -- refresh and look ahead to 2016 with for your favorite eclectic monthly reading series! We'll be back in the upstairs lounge at Hopleaf, 5148 N. Clark St., on Tuesday, Jan. 5 with guests Christopher Sweet, Robert O'Connor, Mare Swallow, Lori Rader-Day and Chuck Sudo. Eden Robins and Andrew Huff co-host. As usual, doors open at 7:00 pm -- no earlier, we're serious. Don't ruin it for everyone else. But do get there as close to 7 as you can, because the room fills up quickly (hence no admittance before 7). The show starts at 7:30 pm. Admission is free, but you must be 21 or older. Don't forget to RSVP on Facebook and bring a friend. And if you're not already, become a fan so you never, ever miss an invitation to one of our readings. Holy standing room only, Batman! This was a popular show... and for good reason! Clayton Smith started us off strong with an excerpt from his new novel Anomaly Flats, about adventure and fantastical... anomalies in rural Missouri. Next up was Gint Aras, reading from his new novel The Fugue, about secrets, neighborliness, and the displacement that comes with immigration. And Britt Julious ended the first half with a powerful essay about the fears and bodily perils of traveling around Chicago as a woman. We swarmed Jason for drinks, and he responded admirably. After intermission, Bill Savage read an essay about why we should stop using the classist and divisive term "dive bars," and James Gordon (aka G.P.A.) wrapped up the evening with a true story about a frightening run-in with gun violence as a young man. It was really a stellar show, and if you missed it, then you are sorry you missed it. But you don't have to miss any more! Tuesday Funk #89 will be on Tuesday, January 5, featuring Christopher Sweet, Robert O'Connor, Mare Swallow, Lori Rader-Day, and Chuck Sudo! Reminder: Tuesday Funk #88 is tonight! It's the last Tuesday Funk of 2015! Don't miss Clayton Smith, Gint Aras, James Gordon, Bill Savage, and Britt Julious! And, of course, your humble co-hosts Andrew Huff and Eden Robins.